The site operator (duty holder) must rely on the effective monitoring of the electrical installation and equipment in order to comply with the requirements of “The Electricity at Work Regulations” and local licensing authorities. – Electrical equipment in and associated with, hazardous areas. – Portable equipment and other equipment connected to the supply via a flexible cord and/or plug and socket-outlet. 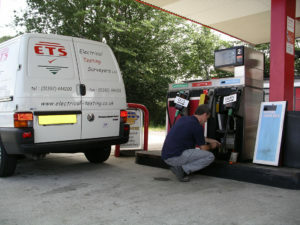 – Circuits feeding car washes and other external equipment used by the public. – Electrical earthing arrangement including measurement of (PME) diverted neutral current. Testing will be carried out to ensure that continuing compliance is maintained and that any defects, deviations or non-compliances are identified (and optionally rectified). Local Authority paperwork will be completed for licensing purposes. Test data and results will also be submitted upon completion.